I didn’t bother with breakfast, settling for a banana and a cappuccino. I finally went and bought a couple of souvenirs. Be sure to ask for your Latitudes discount. It will not ring up automatically. Even asking for it, the cashier forgot to “hit the button”, and had to void the purchase and start over. 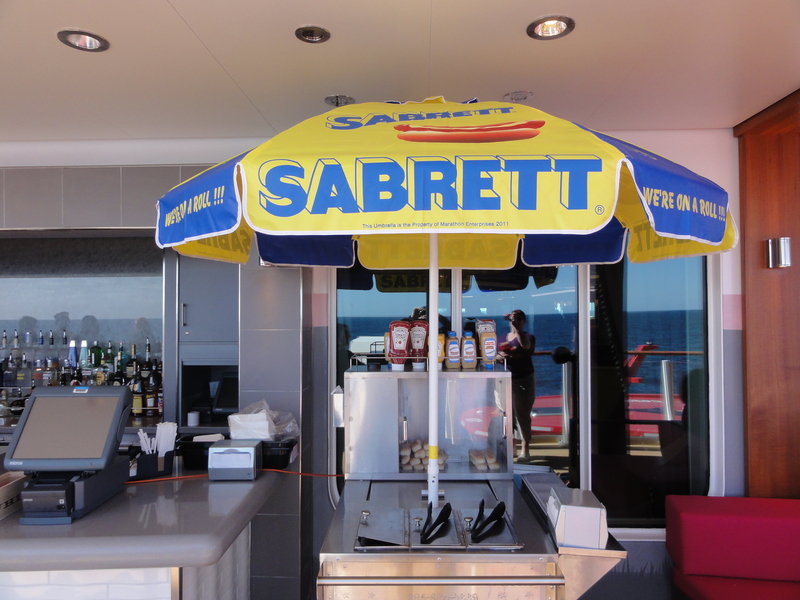 DH and I then hit the Sabrett hotdog cart on deck 8 for a free dog. I had mine with spicy Sabrett mustard and relish. Onions and sauerkraut were also available. It was very tasty (and messy!) and is a fun addition to this NYC ship. The weather wasn’t as wonderful as yesterday, unfortunately. In fact we spent most of the day in a pea soup fog. Oh, well, nothing you can do about that! But it did mean we didn’t linger outside too much and made me happy we took advantage of the great weather the day before. Once back in the cabin we did a quick pack. Boo! But I was happy to find myself 90% packed and able to enjoy the rest of the day. It’s like ripping off a Band-Aid. It’s better to do it quick and get if over with! I realized I was starving after having had only one hotdog and one banana all day, so I checked out the Haven snack menu. It crossed my mind to order the hotdog to see how it compared, but decided on the veggie wrap instead and a nice side of crispy onion rings instead. YUM! 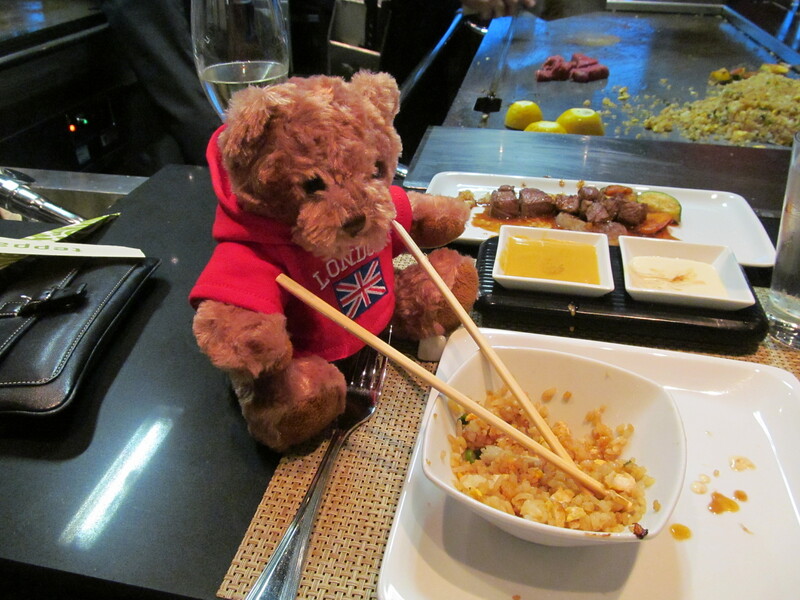 We had an early dinner reservation for Teppanyaki as we had reservations for the nine o’clock Burn the Floor show. Once again our meal was off to a rocky start with cold edamame and lukewarm miso soup being the first courses. But the meal recovered nicely as our chef was awesome and the rest of our food cooked perfectly. It’s the first time I’ve found myself singing Queen’s “We Will Rock You” at dinner, LOL. After dinner, we decided to blow off the show and go to Fat Cats instead. But even that plan fell apart when we ended up at the Haven bar. Everyone turned in early to finish up packing. I was saddened to find out that we’d be arriving in NYC at 4:00 in the morning. Sailing into NYC is always a treat, squeaking under the Verrazano Bridge, and gliding past the Statue of Liberty. But I wasn’t getting up at 3:00 to witness it! 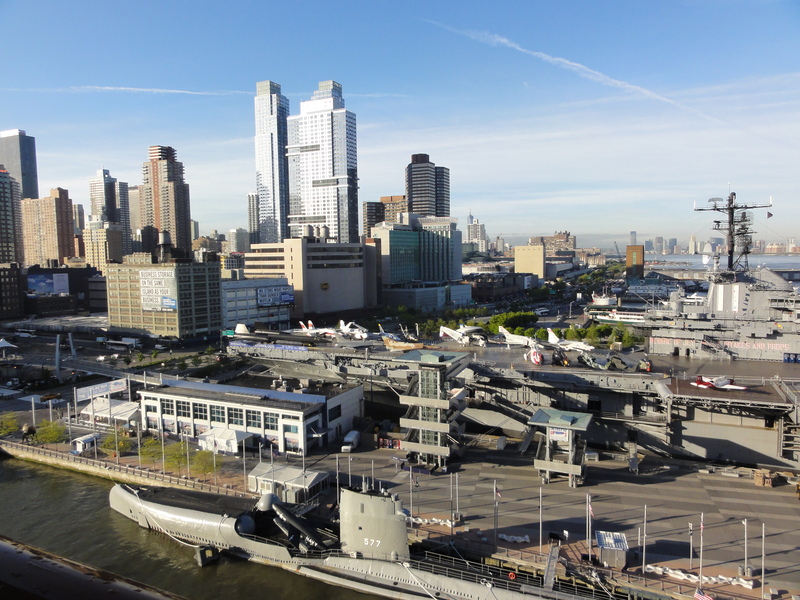 Instead I opened my eyes at 6:30 to find us parked and my view was now of the Intrepid Museum.